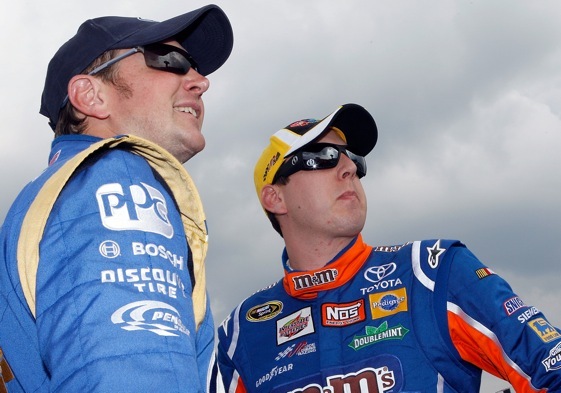 NASCAR’s Busch brothers will spend the 2012 Nationwide Series season as teammates. Kyle Busch Motorsports announced that it has signed a multi-year agreement with Monster Energy Company as primary sponsor of the team’s No. 54 Monster Energy Camry in the NASCAR Nationwide Series. Team owner Kyle Busch, will share driving duties with his brother Kurt Busch, the 2004 NASCAR Sprint Cup Series Champion. Kyle will drive the season-opening race at Daytona International Speedway and the subsequent four races through California before splitting the balance of the season with Kurt. The team’s goal will be to capture an owner’s championship. Kyle is the winningest driver in the series. In 222 starts over nine seasons he has 51 career wins. He also has 120 top-five finishes, 149 top-10 finishes and 23 poles. In 2010, Kyle made Series history with a record 13-win race season. Past NASCAR Nationwide Series Championships for Kyle include a Driver’s Championship in 2009 and Owner’s Championships in both 2008 and 2010 – all with Kyle’s NASCAR Sprint Cup Series team owner Joe Gibbs Racing. Kurt has 12 career starts, three poles and three wins in the NASCAR Nationwide Series with his last Series victory coming at Watkins Glen in 2011. Kurt will spend additional seat time in the NASCAR Nationwide Series, beginning with the season-opening race at Daytona International Speedway through a part-time commitment to Phoenix Racing and the No. 1 NASCAR Nationwide Series entry. To complement the driver lineup, and ensure a strong competitive advantage, KBM brings industry veteran and winning crew chief Mike Beam into the fold as the No. 54 Monster Energy Camry team leader. Beam is a long-time fixture in NASCAR who has accomplished career victories across all three major touring series. At an early age, Mike became a successful contributor towards a variety of competitive racing organizations including Petty Enterprises and Roush Fenway Racing. Most recently Beam obtained the 2011 NASCAR Nationwide Series Owner’s Championship. Through 48 career starts in the NASCAR Nationwide Series as a crew chief, Beam has accomplished 10 wins, 32 top-five finishes, 37 top-10 finishes and eight poles. Mike is also a past Late Model Sportsman (now the NASCAR Nationwide Series) National Championship winner with driver Butch Lindley so working towards an Owner’s Championship with Kyle Busch Motorsports is very familiar territory. Kyle Busch Motorsports and Monster Energy, two of the fastest-growing brands in their respective industries, have positioned themselves together for great success in 2012.